Rebar is short for Reinforced bar or sometimes Reinforced Steel/Reinforcement steel. Without a doubt, Rebar’s are lifelines for concrete and constructions. The base for any construction requires excellent concrete and the rebar makes the concrete several times stronger with excellent structural strength and shows more resistant to any damage. Constructions not always rely on straight rebar, but at often times, to bend rebar becomes necessary and also cutting them too. Apart from the serious construction business, rebar can be quite fun to work with like making rebar letters, making rustic art works, metal sculptures, designing your gardens or adding few structures to your home too. We at Truly Geeky have put together the article how to bend rebar on the notion to help you with all the nuances related with rebar bending in both professional way and also from the ease of your home without any professional equipment. There are some drawbacks of bending rebar or steel rebar manually. Bending steel or any metal makes it weak but when it was done professionally, the damage to the material can be controlled to some extent. You might be thinking whether rebar bending requires knowledge about the type rebar types. Yes. Getting to know your rebar lets you take better choices when it comes to long withstanding construction arena. Right ways and tools to bend rebar depend on the type of rebar we are using. European Rebar – high cost, least preferred, least resistance, cannot expect substantially high structural integrity from their rebar. Carbon Steel Rebar– aka Black Bar, low cost, solid strength, best value/tensile strength ratio, have better options than this black bar when it comes to places of high humidity or water saturation. Epoxy-Coated Rebar – it’s the black rebar with epoxy coating, same tensile strength of a black rebar but shows more resistance to corrosion, delicate epoxy coating is pertained to easy corrosion. Galvanized Rebar – 40 times more resistance to corrosion than black rebar, coated with Zinc, galvanized coating is difficult to manage, 40% more expensive than epoxy coated rebar. Glass-Fiber-Reinforced-Polymer (GFRP) – stronger tensile strength, good alternate to traditional steel rebar, to bend the Rebar of GFRP type will not be productive, it doesn’t corrode,10 times costlier than epoxy coating, extremely light. Stainless Steel Rebar– most preferred Rebar, most expensive compared with epoxy coating, best rebar for constructions projects of any scale, 1000 times more resistant to corrosion, more resistant to damage, to bend the rebar of stainless steel is easy & doesn’t cause you any trouble than other types of rebar, highly corrosive proof. The most common rebar used in present scenarios are made of unfinished tempered carbon steel which is non-susceptible to rusting & corrosion. When combined with concrete which has a pH value higher than 12, the rebar becomes strong and gives you additional protection against corrosion from taking place. Rebar’s come in lengthy rods and hence, cutting and bending rebar becomes a formidable task. To reinforce concrete and increase the tensile strength, it is important to cut and bend the rebar. If you want to do some artwork or garden work using rebar, that time too you will need rebar cut. You can either use professional ways or can do it manually but either way, try to follow the safety measures before start cutting the rebar. If you want to do a rebar cut for your garden or house hold work, use a hacksaw blade or reciprocating saw. If you have many rebar, required for construction or some other work, go ahead with professional tools (Circular saws, portable rebar cutter or bolt cutter). It would offer a safe work efficiently. Some other professionals tools are listed below in section which would offer both rebar cutting and bending. To cut and bend rebar takes more than a physical work. It requires a little professional approach like identifying the types of rebar, the characteristics of the rebar like tensile strength, yield strength, varied rebar sizes and grades. You have specially designed professional rebar bending tools to meet our needs. The powered rebar benders use electricity and are the fastest and less laborious ways to bend rebar. You can choose from variety of models like portable medium-duty/heavy-duty, electric/hydraulic rebar benders which are capable of bending rebar upto 5/8” (#5) Grade 60 with ease. 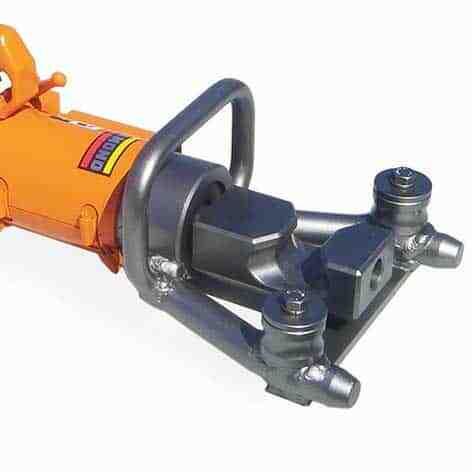 Portable rebar benders comes with features like insulated electric motors, removable bending guide which is used for repeating the same angle bend, interchangeable bending hook, good quality bending die’s, 90° bending shoe and collar set to bend rebar’s at perfect 90° and versatile enough to bend or straight the rebar in-place.Construction projects that demand accuracy and consistency in every bend use this bender only. They come in carry case for portability and other essential tool kits. They usually look like a square box and are used in heavy-duty rebar bending. The table rebar benders have standard foot pedal control switch for hands-free safe bending. Like portable benders, they also work with different diameters & grades of rebar. The table rebar benders have dial-type angle selector which can be set to accurately bend the rebar in any angle from 0-180 degrees. These types of rebar benders have standard features like emergency stop switch, preset angle locks, bending rollers, precision options to meet the ACI 318-05 standards and 2-side lifting handles to easily carry them. 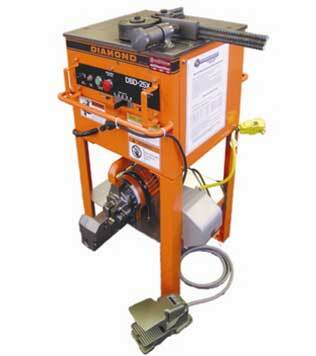 Price of this rebar bending machine comes anywhere in between $1500-$2000. The simplest and easy to use tool is the manual rebar bender in which the only work you need to do is provide the bending force. 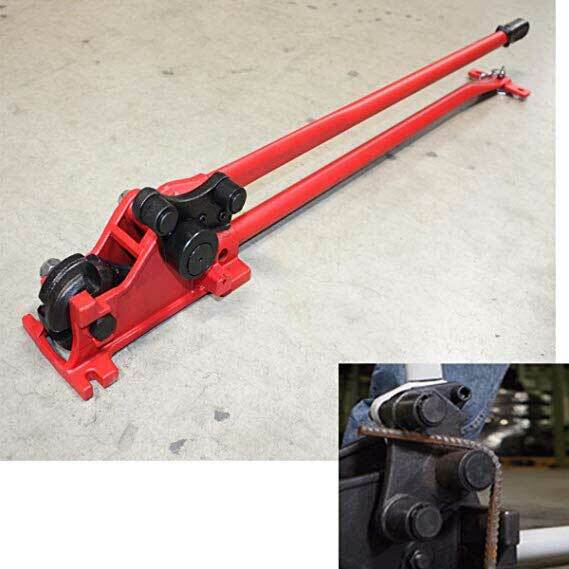 Manual rebar bender has a long handle/lever and a cam mechanism that gives you great leverage upon bending the rebar. 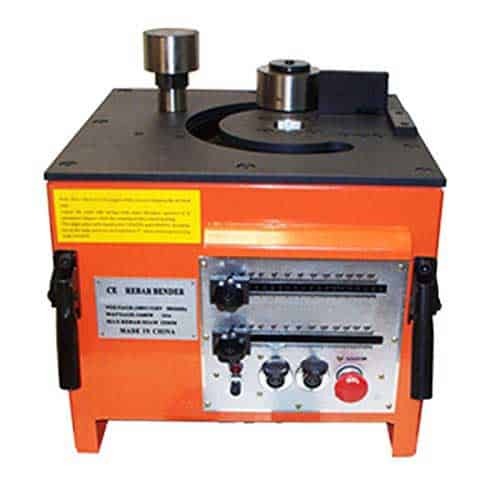 Bending capacity (size & grades) and bending capability (0-180° angles) depends upon the manual rebar bender (and also with the company which makes them) you use, but usually they can handle sizes up to Grade 60 and #5 (5/8”) (16mm). The straight rebar is pressed around a cast-iron bending die and the lever/handle is pressed until the desired bend is obtained. Manual rebar bender doesn’t need any power source, weighs only minimum, highly portable and easy to operate. Though they are economical, they do have limitations like they can bend only one bar a time, some of the manual benders work well with low-grade steel as they bend easily.The overall cost of this bar bender is somewhere between $200-$500. If the handle/lever attached to the manual rebar bender does not provide sufficient torque to bend the rebar, the rebar is too large for the mechanism. Do not use extension bars on the handle to bend rebar. Keep them out of mud, dirt, sand, water and dust. If regularly exposed to dirt, dust and water they will slowly damage the internal mechanisms of the bender. These professional tools combine both units of rebar bender and cutter together on a heavy-duty powder-coated skidded housing. It has a toggle switch that lets you go from bending to cutting with hands-free operation using a foot pedal. It doesn’t require any hard wiring to work with. 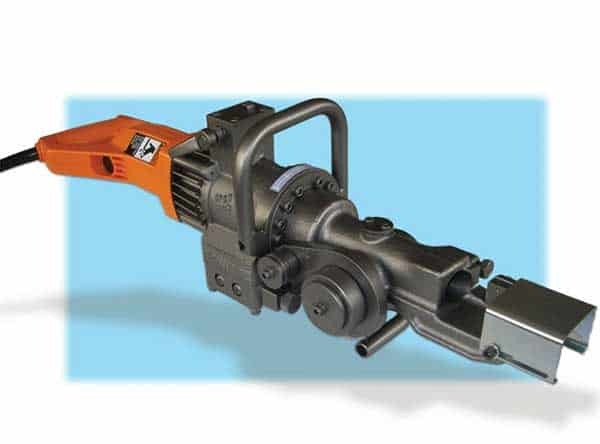 Weather-protective electrical outlets are good choice for this combination rebar bender tool. If you want you can take the rebar cutter out of unit and use it in any other application.But the price of this tool is higher than any other tools in this list.But its truly professional. source:toolfetch.comIt’s most commonly used in the job site for cutting and bending rebar. You have the ability to even cut and bend rebar protruding from the wall or columns, from damaged building parts or for other home uses. This rebar bender/cutter is designed to handle heavy-duty but has no changing attachments to bend rebar at different angles. Keep portable rebar benders out of rain or moisture. They can work in moderate rain but still, exposing them to rain even lightly gives out the chances of motors malfunctioning or burn up. Keep them out of grime or dirt. Don’t just place them anywhere on the ground to just lie as such. Tendency to leave hand-held devices as such will impact the long life of power tools. If the portable rebar benders have a specific capacity then bend rebar’s of that capacity. Anything higher will cause the power tool to burn out the motor. Like any other power tools, portable rebar benders are vulnerable to long periods of poor maintenance. Rebar’s are not always into the serious business of construction as they are also used in making DIY’s, artworks, garden structures, pathways décor, as stands and such. So when it comes to all the above works and home applications, we can use manual ways to bend rebar. Hickey benders come in different variants and it can go upto handling rebar with 5/8”. Hickey rebar bender will look just like an ordinary iron/steel rod but the trick lies in its head. The head of a hickey bender varies with different manufacturers as some offer die-cut facility to the head or some offer hardened studs (usually 2-3) at the head for extra grip while bending. Place the hickey bender head in the required place or in general just fix them to the rebar you need to bend, all you need to give is effort and bending becomes easy with a hickey. Just a little heads up, when buying a hickey bender go for lightweight but exceptionally durable nicely welded sturdy & lengthy steel handle so that it becomes easy and feasible for the effort you put in to work for bending well. When it comes to the hickey head, a durable sturdy alloy-steel can handle the force and helps in bending. Hickey heads are available in varieties for our convenience like aluminum conduit bender heads, alloy-steel heads, die-cut types that comes in different inches/sizes. To bend rebar with a Hickey Bender is another handy method that you can use from the comfort of your home but the only difficulty is that it will take lot of man time and work while it gets messy to work if rebar to be bend are more. We need 2 steel pipes to bend rebar. Lay the first pipe on the ground and slide the rebar into this pipe. Mark the point on the rebar where you want the bend to appear. Now insert the second pipe on the rebar. Leave the mark to appear visible outside. Now step on the first pipe and take the second pipe where you would be using your muscle strength in picking up the second pipe. While using your strength you can see the rebar is bending on the mark you want the bend to appear. To get a clear explanation on this, check out the video here. You will need a forged eye bolt, a piece of lengthy wood and a pipe to create your own rebar bending machine. Fix the forged eye bolt in one side of the wood. The space between the eye bolt and the rest of the wood will be like 1:3. Insert the rebar through the eye bolt. Insert it up to the point where you want the bend to appear. Now put a pipe and insert it on the rebar. Take the pipe standing on the same side. You can stand and move along the pipe when you bend the rebar. Check out the video below and get an idea on rebar bending this way. To do this rebar bender all you need is just $4. 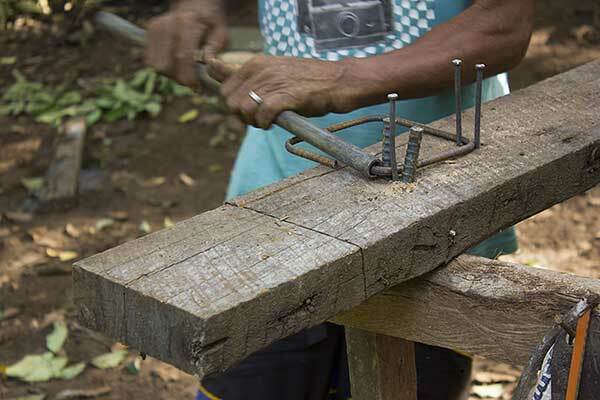 To bend rebar in this method you would need a lengthy wood set up in a standing position and 4 small rebars fixed on the wood. These 4 rebars must be fixed like the one below. Insert rebar into the bars fixed on the wood. Insert the pipe on the rebar. Hold the pipe and bend it at the point where you want the bending to appear. Some of the uses of bending rebar is building cages for plants and animals, plant hangers and other garden supporters. So when you get your next project of bending rebar, consider multiple ways of bending it in multiple shapes and sizes. Why You Should Never Heat Rebar? As you know, steel is the main ingredient of rebar. This is one important material that often consists of other wealthy elements including zinc, lead, or tin. Though heating a bar makes it easy to bend, it will also weaken its elementary composition to some extent. If you are dependent on your rebar in your construction project and rebar supports the weight, you shouldn’t take a risk of re-heating it. Since the weight of your project is supported by rebar, any type of negligence or carelessness can affect the safety of the people involved in your project directly or indirectly. Rebar can be manipulated by heating but it often results in injury or even worse. We hope that you found our methods of bending rebar useful. Now, we might have some questions as like, what kind of rebar bending tools will best suit my needs, How to choose the right rebar bending tools and such. Let’s discuss them. How To Choose The Right Rebar Bending Tool? Getting a professional rebar bender/cutter tool can be a good investment. For that you need to choose the tool based on some factors. Those are described below. You can do the manual rebar cutting / bending to do your DIY works at the house level. But it’s non safety process for both yourself and the rebar you work on. 1) Getting to know your rebar is the important first step. 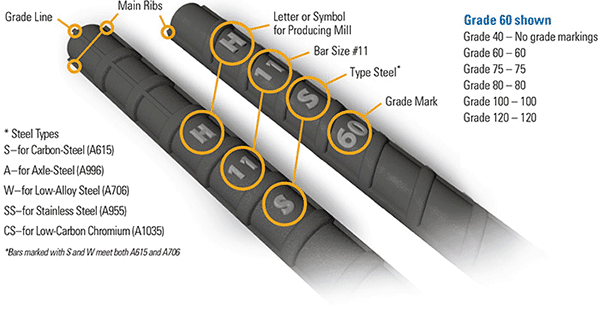 The type, the size, the grade are the important details you should know before you go out to bend the rebar. The standard US Rebar Size Chart gives a full details about standard rebar sizes available, the diameter measurements and other nuances related to the rebar .Every individual rebar will have 4 markings. 4th marking = Grade of the rebar. In the US standards, the rebar sizes are marked with a ‘#’ symbol before like #3, #4, #5 etc., the symbol ‘#’ stands for ‘Number’ and hence it is read as Number 3, Number 4 etc. Ex: US imperial bar size is #3 means – the bar is 3/8” in diameter, #4 – 4/8” in diameter. Professional rebar bending tools comes with specifications like this to tell their capacity to bend rebar. Rebar is available in different Grades. A Grade in the rebar indicates the minimum yield strength of the rebar. Ex: Grade 60, Grade 75 to that of higher strengths like Grade 80, 100, 129 and 150.Grade 60 rebar means it has minimum yield strength of 60 ksi (or 60,000 psi/ 420 mpa- MegaPascals). Metric systems vary with countries. Grade 60 is the most widely used rebar grade in US construction works. 2) You have bending tools designed on the size, type (especially when it comes to epoxy coated/galvanized rebar as not all tools do well with the coated stuff) and grades of the rebar so choose accordingly. A size #3 capacity bender cannot handle anything above. Don’t try to bend rebar sizes or grades that the tool or machine is not designed to handle. 3) The maximum bending angle that can be achieved on the rebar varies depending on the tool’s capabilities and the diameter of the rebar. 4) Choose the rebar bending tools based on the scale of work, job site, and purpose. You can choose from medium-duty rebar benders to that of heavy-duty. When it comes to home applications, landscaping, backyard décor works, a manual rebar bender and methods would do. 5) Bending capabilities might vary from one professional tool to another. So choose the appropriate tool for your need and use. Safety first – make sure you are fully protected , have large open surround space to carry your work when it comes to using professional tools to bend rebar. Follow the safety instructions mentioned for the rebar tools. Simple manual methods to bend rebar will also require safety. Now we hope that we have cleared some air around the whole rebar scenario and about how to choose the rebar bending tool. Last but not least, spend your valuable time by further reading to know the most important point of this whole rebar bending. Bending a rebar to an internal diameter less than the recommended minimum diameter produces stresses in the bend zone that can result in bar weakening or failure. If you want a professional like bending, don’t use makeshift devices such as pipes to bend the rebar. It will be difficult to control the internal bend diameter and the sharp edges of a pipe can notch the bar, weakening it in the bend area. Avoid impact blows: to assist bending, we tend to use sledge hammer which can result in over bending of the rebar and will cause damage to the rebar surface. If you’re using an epoxy-coated rebar, you need to bring more care and precaution to bend them as it might damage the epoxy coating. Epoxy coated rebar bending should be performed around smooth, non-abrasive die to avoid any damage to the epoxy coating. If the coated area does get rubbed-off, it must be repaired first and then you can carry on with your bending. To bend rebar’s can be fun work to do. You can bring your creative side to life with many rebar DIY’s, artworks, garden plants growing structures, rebar letters and it goes on with your imagination.As you might know this manual rebar bending is enough for your house hold works but when it needed for construction, its always smart to go with professional rebar bending tools. These techniques are fast, reliable, accurate, and time-saving. If you know few more ideas on how to bend rebar please leave it at the comment section.We are happy to add new ideas from our readers.